It’s that time of year that many crafters and shoppers anticipate, the big One of a Kind Christmas show. If you love the idea of giving unique handmade gifts but aren’t a big fan of shopping online or don’t trust the postal service to come through for you on time then this is it. This is the time for you to get all your shopping done in one spot, one shot. If you’ve been to the show before you know that it’s a sea of row after row of amazing vendors. Here’ s small selection of new artisans with pieces that I think would make great gifts. And I also just so happen to have TWO PAIRS OF TICKETS TO GIVEAWAY! So you can save your admission and spend it on……..oh how about yourself? There are three ways to enter, you will receive a chance to win with each one. Two randomly selected winners will be chosen on Friday, November 29. 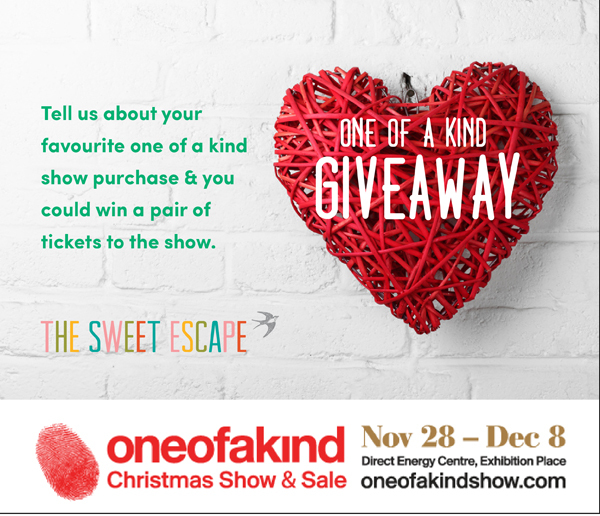 2 – Like The Sweet Escape facebook page and share this blog post. 3 – Leave a comment below with your favourite One of a Show purchase or what you would like to buy if you’ve never been. Did the cribbage board come in a bright green bag? My hubby got one from his auntie but lost it and I’m trying to find the name of the guy who makes these because she keeps asking to play cribbage when she comes over!! Hi Cayla, this gift guide is over a year old so I’m afraid the product info isn’t current. I source a lot of great handmade product for my shop at One of a Kind and would love to have a little extra spending money (save the entrance fee) next week at the show! Some of my favourite OOAK makers (that I carry in the shop) are Mod Pieces, White Feather Designs and Jenna Rose. Can’t wait to see who’s new this year! I was just looking at ticket options yesterday! I’ve never been before and I’ve always wanted to check it out – this year is the year :) I have my mom-in-law this xmas for our secret santa and I’m trying to find something truly unique and handmade…can’t wait to see all the goodies! I’m also on the hunt for handmade backgammon boards – think I might get lucky?! I bought a beautiful necklace several years ago that has always been my favourite purchase from The One of a Kind show. Thanks! Last year at the show, I got a pretty squirrel-proof bird feeder to feed the little birds that come by. But the squirrels looked at me with such sad eyes when I changed the feeder, so now I still feed the squirrels, and they don’t bother the birds anymore. My beautiful Opelle bag. Hand cut and made in Toronto with gorgeous leather! My favourite OOAK show purchase was the hand carved wooden nativity scene I purchased for my mother last year. We go every year with all the women in our family and some free tickets would definitely help! I’ve never been to the OOAK show before but I would love to check out Eve Gravel, Opelle, and Bookhou’s stuff! Major eye candies! I have never been but I have always wanted to go. Friends of mine have bought really neat random things (wallets, baby toys, nighties) and they were all pretty amazing. Would love to just browse around and see all the interesting items.